You may have seen many Japanese dishes with raw egg, but did you know that Japanese people sometimes actually eat eggs which are cooked! Tamagoyaki is the most common type of cooked egg in Japanese cuisine which is made by rolling together thin layers of egg in a frying pan until you get a solid piece of rolled up egg. It tastes great by itself for breakfast or in a bento, or you can serve with rice to make a delicious sushi which is also suitable for vegetarians. 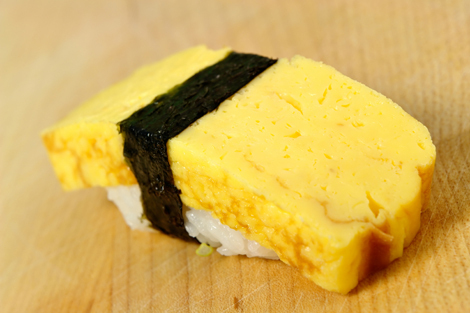 Follow our recipe to learn how to make delicious authentic Japanese tamagoyaki. 1. Firstly, beat your eggs well in a bowl using either a fork, or chopsticks if you are an expert chopstick user! 2. Add one tablespoon each of soy sauce, mirin and sugar and a little salt to your mix. 3. Put a small amount of cooking oil in your pan and bring it up to medium heat. Keep some kitchen roll handy to keep the pan oiled during cooking. 4. Now is time to add a small amount of your egg mix into the heated pan. Once the egg has cooked slightly so that the top is still slightly uncooked, push it over to the side of your pan. 5. Add a little more oil to the pan using the kitchen roll and add another small amount of the egg mix to your pan. Again, wait for this to cook a little, but before it sets on top. You can then begin to roll the first bit of egg over the mix you just put in the pan until you have a small roll of egg. 6. Continue adding a small amount of egg while oiling the pan each time in between. As you add more egg and roll it up each time, your egg roll will start getting larger and easier to add new layers. Keep adding the egg in new layers until you have used it all up. 7. Your tamagoyaki is now finished so remove from the pan and wait to cool before slicing it up into thin pieces with a sharp knife. • Instead of using mirin and soy sauce, you can simply use normal Japanese dashi soup stock to achieve similar results. Try using one sachet of dashi stock powder for a great taste. • After cooking, you can place the tamagoyaki in a sushi rolling mat and roll up tightly to get a solid roll. This is a good idea especially when you first start making tamagoyaki to make sure the roll is tight and easy to cut. • You can try adding different ingredients like spring onion and nori seaweed for extra flavour. Just make sure to chop them up very finely before you add them to the mix. • You don’t have to use a special square frying pan to make tamagoyaki, but you may find it easier than using a normal round one.